It was a stormy Christmas rather than a white one in these parts, and the worst affected area near Manchester was Cheshire, where many homes had their electricity supply cut off. There has been criticism of electricity companies Manweb and Norweb. People have complained that the companies took too long to restore power - five days in some cases. Luckily, there were no power cuts here in the city, though the wind was fierce. Driving through south Manchester on Christmas Day I saw broken branches on the ground, but no major damage. In Cheshire the day after, I saw trees uprooted, and electricity workers repairing power lines on country lanes. The local news scene has understandably been quiet during the Christmas break. We have yet to find out whether tough anti-drink driving campaigns have had an effect on road accident figures. Drunken driving was not responsible for the deaths of Dorothy Ward, 53 and her husband Gordon Hughes, 45, who were knocked down by a car outside the White Lion pub, Swinton over the weekend. The driver, Stewart Unsworth, a vehicle valet, lost control of the vehicle and ploughed into other cars before hitting the couple who were sitting on a bench ouside the pub. Unsworth, who was said at the crash scene to be screaming with shock, was unable to explain how the crash occurred, and said he thought he had had a blackout. He gave a negative breath test. He was arrested on suspicion of reckless driving and given bail. And police officers suffered whiplash injuries when a six mile car chase through south Mancheter ended in a collision. A twenty year old has been charged with vehicle theft and drunk driving. Christmas puddings caused confusion and delay at Manchester Airport: On the screens of security scanners, the tightly packed yuletide treats look the same as Semtex explosive. Security officials checked each and every pudding, causing delays, but ensuring Manchester's high safety standars are maintained at all times. And today, Manchester Airport saw some real-life drama: During check-in for a flight to Pakistan, a 17 year old girl started screaming and asked other passengers for help. She was found to have been drugged. Sekina Khan, 40 and Mohammed Bashir, 41from Bradford, were arrested and charged with drugging and falsely imprisoning the 17 year old. British Midland, who recently announced their new daily service to between Manchester London Heathrow - challenging the monopoly of all-powerful British Airways - will transfer 50 pilots and cabin staff to Manchester, and will also take on 100 new staff. It's been a wet, windy week in Manchester, with storms on Tuesday night, and rain yesterday and today. 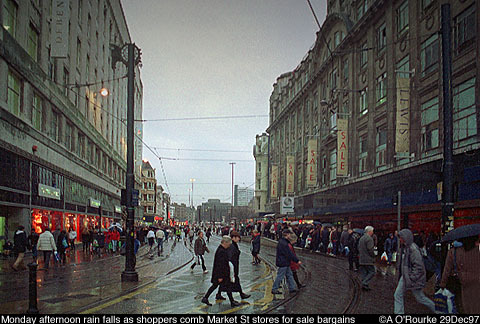 Late afternoon shoppers crowding the city centre for sale bargains felt Manchester raindrops on their heads - The forecast is for cloudy weather, and temperatures in the range of 3-7 degrees celsius, 35-45 fahrenheit. And the forecasters say gales will return on New Years eve, though they won't be as ferocious as before. TO ALL EYEWITNESS IN MANCHESTER READERS: VERY BEST WISHES FOR 1998 AND PLEASE KEEP VISITING! Cases of "Chicken flu" prompt the Hong Kong authorities to slaughter thousands of chickens. No-one guessed last week's pub. It was the Salisbury, located just off Oxford Road. 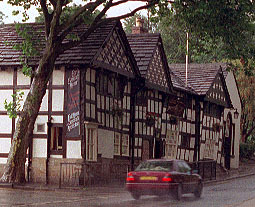 This week's watering hole is located out of town - Middleton to be exact, near St Leonard's church, but what's the name of this attractive half-timbered establishment? We appreciate all the hard work you have put into keeping expat Mancunians up to date with what is happening back home. Not all the news is good of course, but that's how life is. 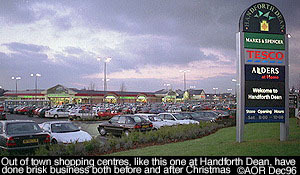 As sites go with info on the local areas this has to rank with some of the best. I like your dedication to the photographic side of the page, you obviously enjoy the challenge, this can be seen in your choice of angles, these are no quick snaps, and your time taken to compose both shot and execution to web page does you credit. I have been looking through your web site for some time, and I thought that I would drop you an email to say how wonderful I think it is. I love it, and have sent so many links to my stateside friends, because I know they have no idea of where I come from, or the vast cultures that have woven themselves into Manchester. Thank You so much lovie.